Venus Williams is still breaking new ground in tennis two decades after her first U.S. Open appearance. Her semifinal match Thursday evening against Sloane Stephens (ahead of Madison Keys vs. Coco Vandeweghe) marked the first time since 1981 that American female athletes are dominating the 136-year-old hard court competition. Williams, who competed in her 19th career U.S. Open, made more milestones last July. At BB&T Atlanta Open, Williams’ exhibition match against Genie Bouchard was the first time in the tournament’s 96-year history that women participated as competitors. Playing in front of a sold out crowd in Atlantic Station, the four-time Olympic gold medalist triumphed over Bouchard, a 2014 Wimbledon finalist, with 6-4 in the first set and breaking a 6-6 tie with a 7-4 score. The evening game was all fun for Williams. Williams, who now lives in Palm Beach Gardens, Florida, brought along her exceptional two decades of vigorous and tenacious athleticism to the hard court. Her performance against the young Canadian tennis pro was full of endurance-heavy maneuvers and fierce serves. Standing six-foot-one, the stylish best-selling author and certified interior designer’s glided, sprinted and hustled across the blue asphalt in a sheer aqua blue ensemble with purple floral design. Her costuming was actually an original from the Needlepoint collection of her clothing line, EleVen by Venus Williams. Rocking rhythmically from side-to-side anytime she anticipated Bouchard’s serves, Williams’ swift and aggressive right-handed swings attacked the ball. Williams’ swing was accompanied by her signature grunt. Part of her game plan is paying close attention to the nuances of her competitors’ performance.“I haven’t played her [Bouchard] in a number of years,” shared Williams, seated with her legs crossed. Williams became a household name when she became a pro at age 14. Now 37, the seven-time Grand Slam singles champion isn’t bothered by her age or any potential health issue prohibiting her ability to upkeep her competitive attitude. She says she maintains a consistent workout regimen: actively practicing her swing as warmup drills. A finalist at this year’s Wimbledon games, Williams has been battling the autoimmune disease, Sjogren’s Syndrome, since 2011 but refuses to let it affect her playing. She plays a lot of team tennis to keep her energy level and breathing under control. The NAACP Image Award winner actively conditions and stretches when she has to adapt to various temperatures and geographic regions for matches. Williams also says she intentionally avoids sugar in her diet: favoring healthy proportions of green vegetables. The winner of 746 career matches, Williams mentions that self-care is necessary for remaining a relevant sports figure. 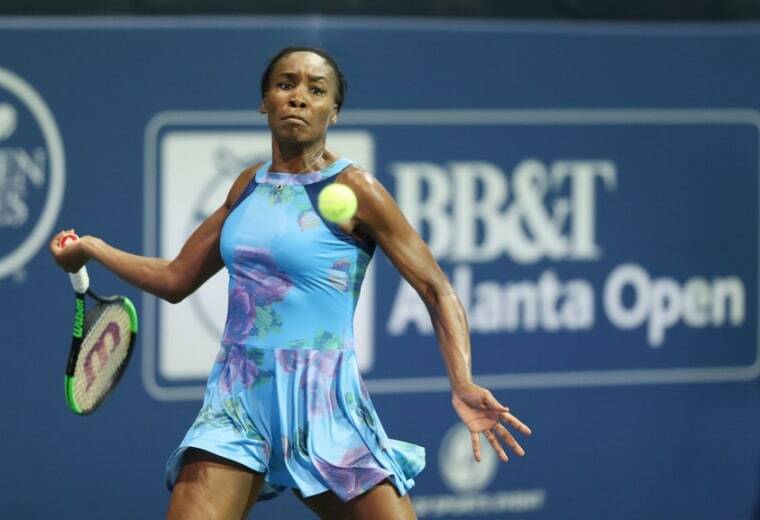 Williams reiterates that her record-breaking appearance at this year’s BB&T Atlanta Open was an opportunity for her to raise her personal athletic standards, along with the standards of professional tennis. The advocate for gender equality in the sports industry is proud she can continue to leverage competition with her personal mission to inspire generations of athletes, especially women, to always give their best.